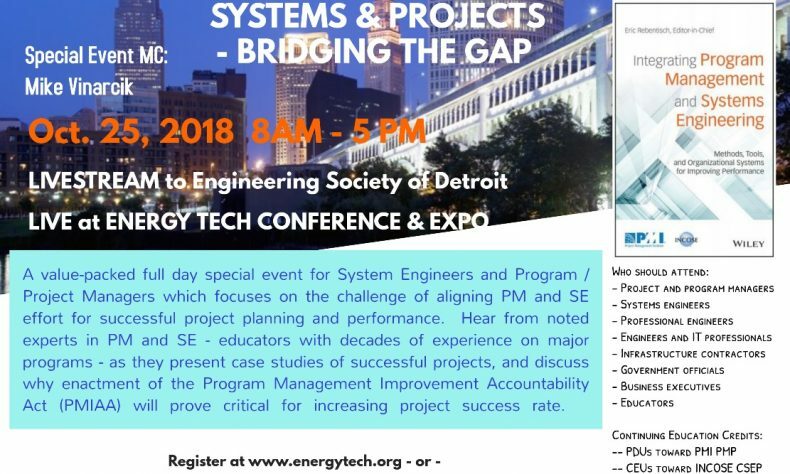 SOUTHFIELD – The Engineering Society of Detroit will host a live simulcast Friday of a major systems engineering and project management conference being held in Cleveland. EnergyTech2018 is being held at the Cleveland IX Center in Cleveland. Those in the Detroit area can watch Friday’s proceedings at ESD, 20700 Civic Center Drive, Suite 450, in Southfield. The full-day event for systems engineers and program and project managers will focus on the challenge of aligning project management and systems engineering for successful project performance. Noted experts in PM and SE – educators with decades of experience on major programs – will present case studies of successful projects. The event runs from 8 a.m. to 4:30 p.m. The cost is $99 for PMI, INCOSE and ESD members and members of ESD affiliate groups. The event is $139 for non-members. Register at www.energytech.org or https://www.tickettailor.com/events/energytech/192426/. Speakers are to include Virginia Greiman, senior advisor and chair of the Cyberlaw and International Policy Centre at the United Kingdom-based Centre for Strategic Cyberspace and Security Science; William Moylan, associate professor of construction management in the College of Technology at Eastern Michigan University and a consultant, trainer, educator, and practitioner in project management and construction engineering; Randall Iliff, a seasoned large-project manager and expert in systems engineering and a founding member of INCOSE; Robert Halligan, an executive professional engineer, manager and engineering practitioner with experience with major global tech companies and the Australian Department of Defence; and Michael Pafford, who has 45 years of combined experience at the U.S. Air Force, the U.S. Navy, and university and commercial experience in a wide variety of engineering projects. Appearing at the simulcast in Detroit will be Michael Vinarcik, senior lead systems engineer at Booz Allen Hamilton and adjunct professor at the University of Detroit Mercy. He has nearly 30 years of automotive and defense engineering experience. The Cleveland event is a joint effort from the North Ohio chapter of the International Council on Systems Engineering (INCOSE) and NASA’s Glenn Research Center in Cleveland.